Telangana CM KCR meeting finished with Janata Dal (S) chief and former chief minister Deve Gowda.On Friday, along with film actor Prakash Raj,KCR met with former Prime Minister Devendougou in Bangalore and they discussed on to set up an alternative political platform in the country.On this occasion KCR started his speech in Kannada as 'Ellarigu Namaskara'.KCR said that there would be happen great changes in the country.Congress and BJP ruled the country for more than 65 years ... Deve Gowda, VP Singh, Chandrasekhar, Charan Singh, Morarji and others have ruled the country for some time.Then KCR spoke to the media. 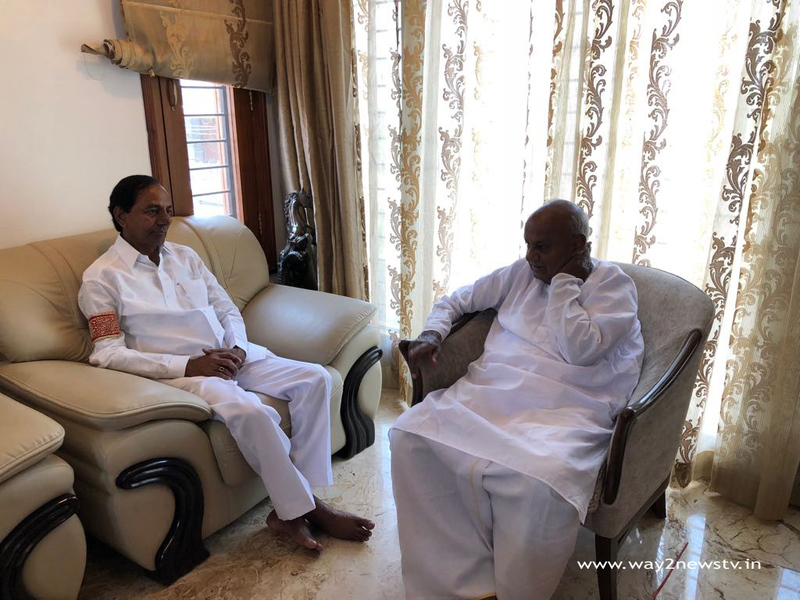 The Chief Minister recalled that he had met Deve Gowda during the Telangana movement and even after his support. "For the sake of politics, our front is for the people," the KCR said. KCR told reporters that Congress and BJP failed to fulfill the wishes of the people of the country and rulers were unable to provide drinking water in 65 years. The Cauvery issue has not been resolved so far and the Brijesh Tribunal has not been resolved on Krishna water dispute. KCR said that the water supply to the entire area of ​​the country would be 30,000 tmcs, but the irrigation regime is causing water problems. KCR said that the people of Karnataka were supporting the JDS and praised Deve Gowda for the welfare schemes implemented in Telangana. The Congress and the BJP governments have failed to address many issues in the country for 70 years. The Center has questioned why the Center has not resolved the water disputes between Tamil Nadu and Karnataka. Pending water disputes, the center of the states accused the war environment of creating. In 2004, the Brijesh Tribunal was set up for the solution of Krishna waters. Though 14 years ago, the Tribunal could not resolve the issue of Krishna waters. The states ruled out of the water, and the central rulers of Delhi were sitting by watching. The Third Front was not only for the development of the states but also for the qualitative changes across the country. The conference was attended by ex-PM Deve Gowda, former chief minister of Karnataka and actor PrasruRaju.